Mysteries of History: “How fast does molasses flow in January?” ~ The History Girl! 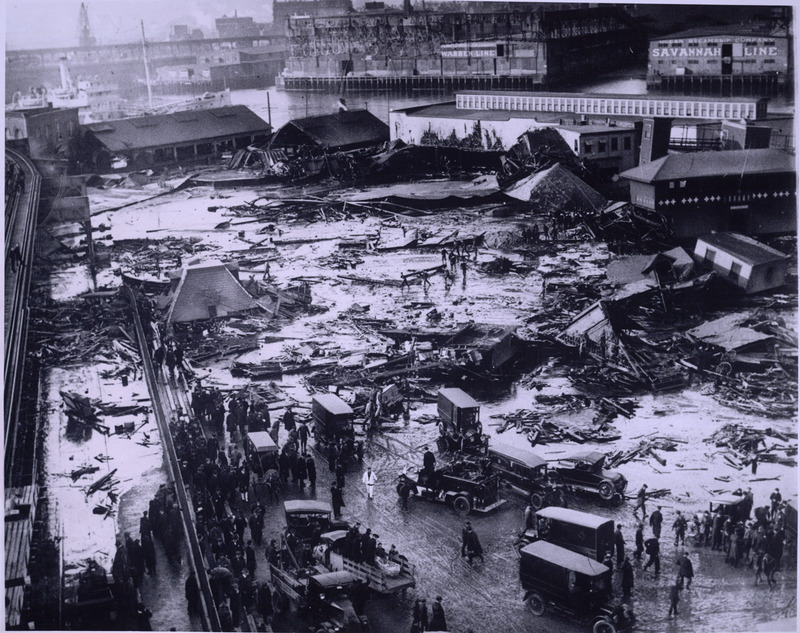 On January 15, 1919 in the North End of Boston, one of the strangest man-made disasters occurred. A 50-foot tall iron tank that contained 2,300,000 gallons of molasses, owned by the Purity Distilling Company, ruptured at one of its seams. This breach caused a 40-foot tall wave of sticky goo to travel at a speed of 35 miles per hour, killing eleven people and injuring fifty. A section of the tank landed on the local fire department, crushing the building, killing three employees. Wagons, carts, and motor trucks were overturned, while a number of horses were killed. The huge wave did not show any mercy. It plowed down everything in its path. The black sticky mass slapped against the local buildings like the ocean tide crashing against a seawall, and then subsided towards the harbor. Other structures that were thought to be safe, found out that they were no match for a monster like molasses. The elevated train tracks - huge steel girders - were not safe. The giant fist twisted the steel as if it was a child’s toy. No one is certain of the events of that day; some people claim that the unseasonably warm weather had caused the problem, while others blame a leak in the tank. This leak was so severe that the locals would send their children with pails to fill them with the sticky goo. This flaw was such a problem that instead of repairing the hole, Purity painted the area brown so the leak would not be noticed. Until this day, when people walk the Freedom Trail, they will stop around Cobb’s Hill and take a deep breath. The aroma of the sweet scent lingers on to this very day. The truth will be forever lost, but the people of Boston will tell you that the British troops of 1776 were not the only force to wreak havoc in the North End. 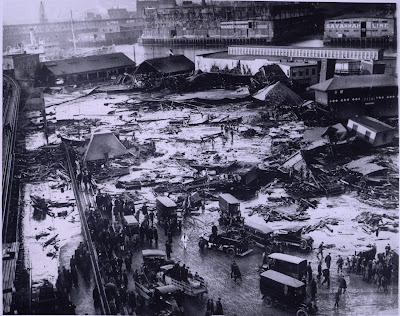 Aftermath of the molasses disaster; photo by Globe Newspaper Co.
Scott M. Cooper, the author of "Mysteries of History," is a Massachusetts native, now living in Florida. Cooper, a freelance writer, is the owner of The Elegant Quill, which offers ghost writing, fiction, non-fiction, editing, and proofreading services. He may be contacted at smcooper5289@gmail.com.